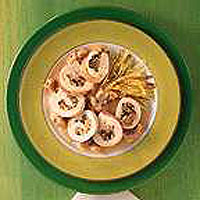 Sweet, soft chestnuts go well with mushrooms and walnut oil in this delicious autumn recipe. As chestnuts contain so much starch and so little oil, they are treated as a vegetable and must be boiled or roasted before being eaten. To shell and peel a chestnut: cut an X on the flat side and roast in a shallow pan for 20 minutes. Allow to cool, then use a sharp knife to remove the shell and skin. Open out the thickest part of the chicken fillets with a sharp knife. Flatten the fillets with the heel of your hand. Drop the chestnuts into boiling water for 2 minutes, then drain, refresh with cold water, dry and chop each one into 3-4 pieces. Heat 1tbsp walnut oil in a pan, add the mushrooms and onions and fry gently for 4 minutes. Stir in about a third of the chopped chestnuts and season with salt and pepper. Divide the mixture between the chicken fillets. Roll up and wrap a rasher of bacon around each fillet. Put on a lightly oiled, shallow baking tray, brush the tops with walnut oil and roast in a preheated oven 190ºC, gas mark 5 for 35 minutes. Remove from the oven, drain the cooking juices into the pan and leave the chicken to rest. Add the crème fraîche to the pan with 1tsp walnut oil and salt and pepper to taste. Bring to simmering point, stir in the remaining chestnuts and bubble for 3 minutes. Cut the chicken into 2cm thick slices and serve with the sauce. Serve with matchsticks of leeks fried until they begin to colour.